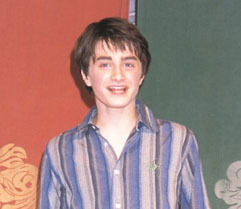 Daniel Radcliffe was a cute child actor with just two credits to his name when he was chosen to play Harry Potter in the film adaptations of J. K. Rowling's books. His father was a literary agent with the show business giant, International Creative Management (ICM), and his mother was a casting agent. In one of his first interviews after landing the role, Radcliffe said he had tried reading the first book in the Potter series a few years earlier, but gave up only partway through.